﻿﻿﻿﻿I've been hunting for the ideal natural moisturiser. If there is one thing my regimen lacks it is this. So far, I use Giovanni Direct Leave-In but I'm not satisfied with it. On top of this, I need a completely protein-free and glycerin-free moisturiser for those times when my hair is overloaded (from protein treatments or henna) and the air is dry. That's when I came across Darcy's Botanicals (DB). I read a few positive reviews for DB's Transisitioning Cream (TC). I chose the Curl Smoothing Cream (CSC) instead because both products contain coconut oil but according to the ingredient list, it had less of it. Many people believe coconut oil can make protein-sensitive hair feel dry. Use as a daily or weekly leave-in to help detangle, moisturize, defrizz, and soften your lovely coils and curls. 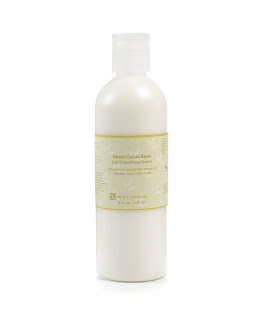 An excellent moisturizing leave-in cream which works great for all hair types. Also great as a styler for curls, twists and braids. Smooth a small amount throughout dry or damp hair and style accordingly. I decided to chronicle its effect for three weeks. I wash+deep condition my hair weekly. My bottle is out of shape after 3 weeks of use. At this point I won't rate this product. Instead of giving it a "five star" type review, I'm simply going to break down some qualities and give my assessment thus far. I really do think it is best used on dry hair over damp or wet hair. I've had my best results that way. Would I detangle my hair with this? Nope. This product does seem to help my hair maintain moisture better than most other products. It goes on very greasy giving the impression that it will leave your hair feeling that way. However, once it absorbs it does make the hair feel supple and NOT greasy. It does help to smooth hair and control frizz. On the flipside, I feel like sometimes if you use it with other products (oils, butters, silicone-based products) it will not work nearly as well. For excessively dry hair--it is no magic bullet. If hair is already soft from deep conditioning, it helps to keep it that way. I wish so badly this came in bigger sizes and with a pump like the Transistioning Cream. The squeeze bottle makes it all too easy to pour out more than you want to use at a time. It is reasonably priced for a hand-made natural product (I purchased for $12 US). Unfortunately, as already stated, the packaging does not help you to use it sparingly. Additionally, I feel like it may not last as long as I want it to because I am heavy-handed and have a lot of hair. At 8 oz it is exactly the same amount as the Qhemet Biologics Burdock Root Butter Cream (which lasted me 3 months) but I am going through it much faster. Giovanni is cheaper for more product. That being said--CSC seems to work much better than Giovanni. Like sweet chocolate cake icing. Does linger, but not overpowering. Because this product is marketed for naturals and not relaxed hair, it can't be expected to work for my hair in the manner that I'm using it. It isn't a magic solution for my dryness yet but it is a very good product. Not sure if this will be a staple. I think I will try the Transistioning Cream in the future just to compare.